Fredrix is proud to introduce a new innovation in eco-friendly canvas products! Lightweight and durable, Fredrix Paint Boards are available in two surfaces, 100% archival Belgian linen and 100% archival cotton for mixed media. 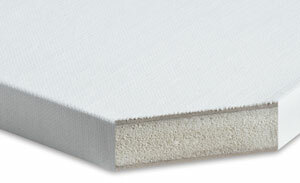 This archival, 100% Belgian linen surface accepts acrylics, oil paints, alkyds, and tempera paints. ® Fredrix is a registered trademark.™ NatureCore is a trademark.